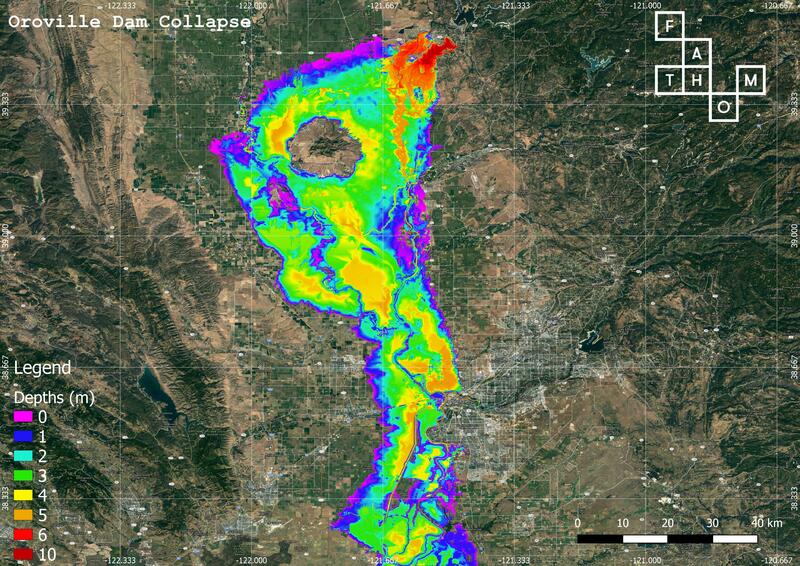 The largest plausible flood events in many areas of the world would occur as the result of a catastrophic dam failure. 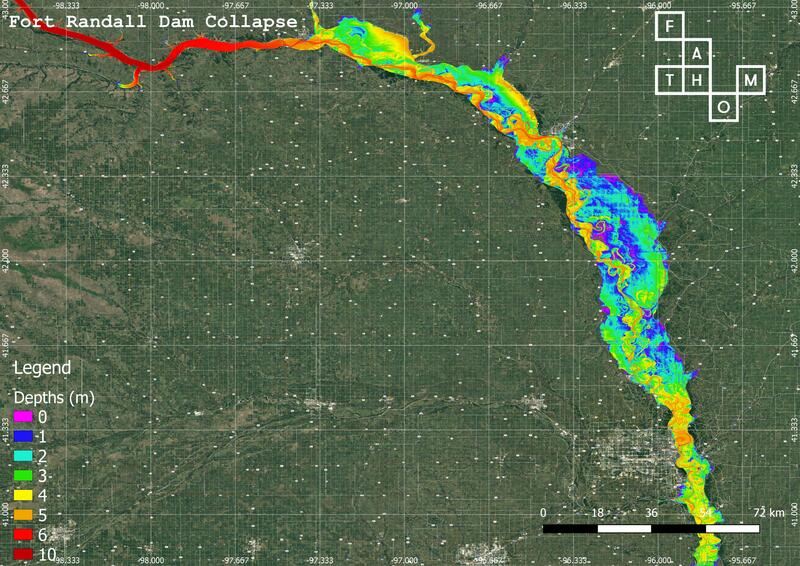 While quantifying the probability of any individual dam failing is very difficult even with the aid of detailed engineering studies, it would be remiss to assume that such failures are so implausible as to be ignorable. In addition to the possibility of failure due to 'natural' causes such as extreme weather events, erosion or tectonic activity, dams also remain a major national security concern for governments facing possible hostile actors. The US has flirted with disaster a few times in living memory, with the near-failure of the vast Glen Canyon Dam that holds back Lake Powell in 1983 offering the closest brush with a truly apocalyptic dam break the modern US has experienced. In this instance, cavitation in the dam spillway tunnels led to complete erosion of their 3 foot thick concrete linings in places and, had this continued unabated, further erosion may have caused a connection to the reservoir floor resulting in the complete uncontrolled emptying of Lake Powell. What is perhaps most alarming about this event is that it occurred during a relatively small flood along the Colorado River which had an estimated return period of just ~1 in 25 years. While subsequent engineering works have mitigated against this risk at Glen Canyon, one only has to look back to 2017 and the Oroville dam crisis in California for another example of near-catastrophe. 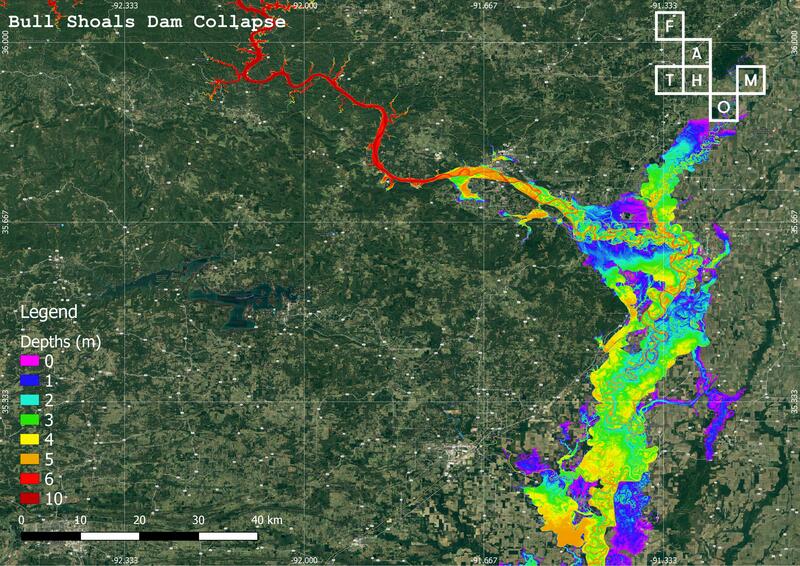 At Fathom, we therefore felt it would be an interesting exercise to compile a database of all large dams in the USA and simulate the potential flood footprints associated with a catastrophic failure of each. The largest dams required unbroken model domains extending many hundreds of kilometers, which at a simulation resolution of 30 metres provided an interesting technical challenge for our hydraulic model frameworks. This completed dataset provides our clients with an interesting and valuable tool for assessing PMLs and other 'worst case' realistic disaster scenario metrics.